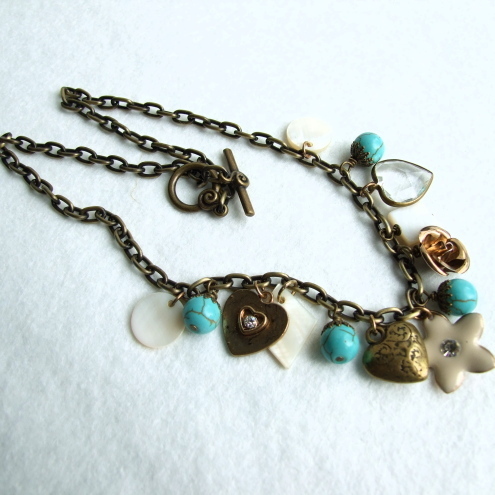 Folksy :: Buy "Turquoise and Shell Charm Necklace"
Semi Precious Turquoise is paired with cream shell shapes and bronze charms and chain in this pretty necklace. Necklace length 18 inches. Chain and fittings are antiqued plated bronze finish. Toggle Closure. Folksy :: Buy "Turquoise and Shell Charm Bracelet"
Folksy :: Buy "Pretty Shell Nugget and Howlite Turquoise Necklace in Sterling Silver"